The Van Voorhis Trailhead on the Mon River Rail-Trail (near mile 4) is located on the former Quality Glass site. It was been a long process of seeing this property transform from a brownfield property (former Quality Glass site, with contaminated soil) to a remediated brownfield (safe for public use) to a community asset as a popular trailhead with restroom, parking for 30 cars, trailhead signs and bulletin case for the rail-trail, drinking fountain, and kayak/ canoe launch. In 2008, our first grant was submitted for a trailhead that included large parking area for trail users and non-motorized boat access for the Upper Mon River Water Trail. In 2011, the property was still going through the brownfield remediation process with grant from the EPA to Monongalia County Commission, the then property owners. Once this was completed, Star City took ownership and MRTC started the process of getting trailhead agreements with Star City, building the parking lot and restrooms, getting zoning, floodplain, and Army Corps of Engineers permits, and trying to design a good launch that was fun, safe, and met permitting and remediated brownfield requirements. 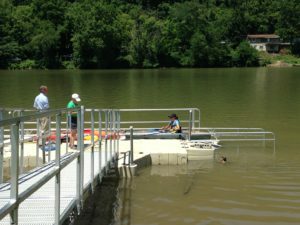 This project has been a collaboration of many community partners including the Town of Star City, Monongalia County Commission, North Central Brownfield Center, and the Mon River Trails Conservancy. Thank you MRTC members for your donations, which enabled MRTC to provide the 20% local match to the Van Voorhis Trailhead Recreational Trailhead Grant! The Mon River Trail Van Voorhis Trailhead project is partially funded by a grant from the Federal Highway Administration’s Recreational Trails Program administered by the West Virginia Department of Transportation, Division of Highways.